Panasonic says it’s created the world’s best weather model. 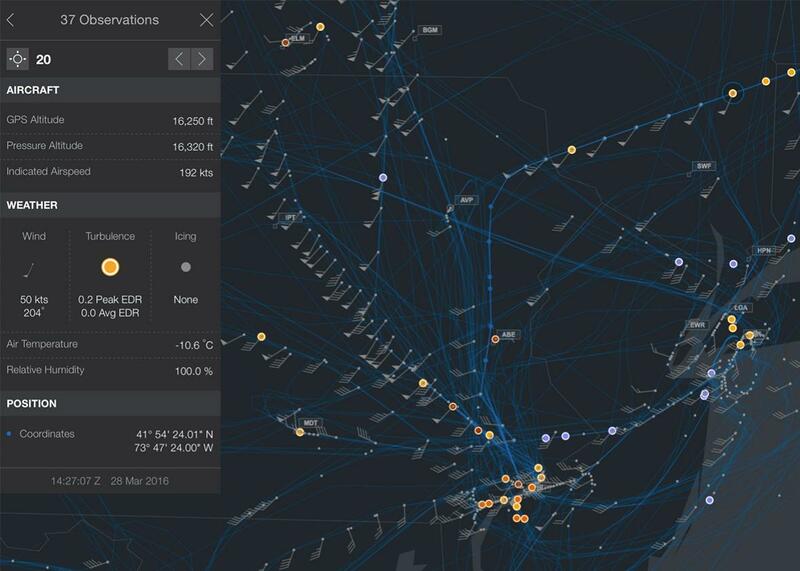 Weather data from airplanes is fed into the Panasonic model—which then helps airlines optimize their flight paths. What happens when you’ve cracked the code of the atmosphere, but you still have to report to shareholders? This is the start of a new era for weather forecasting. If individual companies can now match or exceed governments when it comes to modeling our planet’s atmosphere, we may be in for a very interesting next few years. (Last year, I wrote about some truly Back to the Future II–like technology that’s now allowing some companies to provide to-the-minute weather forecasts based on networks of smartphone sensors.) Since weather is one of the important variables in the global economy, better forecasts could be a boon for everyone from farmers to Little League coaches. Traditionally, governments have been the ones to build and run weather models. First, they chop up the atmosphere into byte-sized chunks based on input from things like weather balloons and orbiting satellites, and then they run a whole series of mathematical equations to figure out the most likely future state of weather patterns—a process that’s hugely computer intensive—indeed, some of the world’s most powerful computers are used to forecast the weather. In the United States, that processing is carried out by the National Centers for Environmental Prediction, a part of the National Oceanic and Atmospheric Administration. Meteorologists then use the results (along with a lot of other information) to construct actual forecasts for actual cities. Since government weather model output is typically shared for free, that’s what most meteorologists use. But cheaper computing power has increasingly leveled the playing field. In 2015, the Weather Channel scored a forecast coup during a major East Coast blizzard thanks in part to its own proprietary approach to analyzing the data. That’s exactly why IBM bought the Weather Channel’s parent company last year (for the data, not for the pretty faces on TV), and that’s exactly why Panasonic has been in the weather forecasting business since 2003—weather affects everything. According to Neil Jacobs, the leader of Panasonic’s weather forecasting division, the company’s weather business is intended in part to help airlines optimize their flight routes and to provide high-resolution temperature forecasts for commodities traders anticipating natural gas or electricity prices. He said the company’s supercomputer is “not nearly as big as what [the National Centers for Environmental Prediction] has,” but it’s almost exclusively devoted to the weather model—unlike the government’s computer, which is split among multiple tasks. Panasonic also has a bit of an advantage because it has data independently collected from commercial aircraft, which essentially replicates a weather balloon launch each time an airplane takes off or lands. Jacobs says once Panasonic expanded its data collection from airplanes to Europe and Asia, it was more computationally efficient for it to create its own model at the same time. NOAA already buys some of the aircraft data from Panasonic to help improve government forecast models. In past emergency scenarios going back 10 years or so (defined as days when NOAA issues a call to its offices to ramp up the frequency of weather balloon launches), Panasonic has provided all of its raw data to the government at no cost. Panasonic hasn’t yet shared its forecast output with the government, though. During last hurricane season, Jacobs says he was in email contact with scientists at the National Hurricane Center to give them qualitative updates, “but they haven’t seen any graphics or anything.” Detailed forecast output from Panasonic’s model, even if it’s just a screenshot of the projected track and future intensity of a developing hurricane, could provide the NHC with information that might sway its forecast. Jacobs says he doesn’t have a problem sharing more quantitative information with the NHC in the future, like graphics, but he is worried about the legal implications of sharing proprietary data with the government—since a public agency is obligated to make all data it acquires public, and that could eliminate Panasonic’s proprietary forecast advantage. But what about that claim that Panasonic is now the world’s best? Jacobs said the company is in the process of partnering with universities to provide third-party verification and is planning to launch a public website that may include time-delayed output of its model to further increase transparency. Panasonic didn’t do all this from scratch. The company’s model is actually a modified version of the GFS model. Since that model was taxpayer-funded, anyone can use it and modify it. And Jacobs’ team has. In response to an official request for comment from NOAA, Vijay Tallapragada, a scientist at the Environmental Modeling Center of NCEP, said there are currently no plans to match some of the Panasonic model’s features, though a major upgrade is scheduled for this month, and a future upgrade in 2017 or 2018 should boost the GFS to a similar spatial resolution, about 9 kilometers. * Models with higher resolution can typically provide more detailed forecasts. If Panasonic’s claims are true, this is an important development, but at heart it is still just an incremental increase in forecast skill. Still, the decision to keep this model private presents an interesting ethical question: If a hurricane is heading for Miami and this model knows things that others don’t, does Panasonic have a duty to share some information? “It is at least plausible to think that Panasonic is not obligated to share its model with the scientific community (and the public more broadly), even though it would be good for the company to do so,” wrote Toby Svoboda, an ethicist at Fairfield University, in an email. “On this view, sharing the model would be ethically desirable, but doing so would go beyond what is ethically required.” That’s because sharing the model would only increase the probability of saving lives, and there’s no way of knowing which specific individuals would be helped or harmed—or, if anyone would be helped at all. At worst, Svoboda said, if Panasonic refused to share information, it could be accused of negligence, but not responsibility for harm. Other members of the meteorological community, many of whom are eager to see a bit more detail about the Panasonic model, also expressed a desire for greater transparency. In an ideal world, Panasonic would make its entire model open source—but that’s very unlikely to happen. More realistically, the National Weather Service will license it, and its output will be incorporated into our daily forecasts. Those Little League coaches will still benefit, and Panasonic will profit. If it succeeds, it could be a model for further forecast innovations by other private companies. Long-range weather forecasts tend to be unreliable—but I think it’s safe to predict that the next several years will be very interesting.